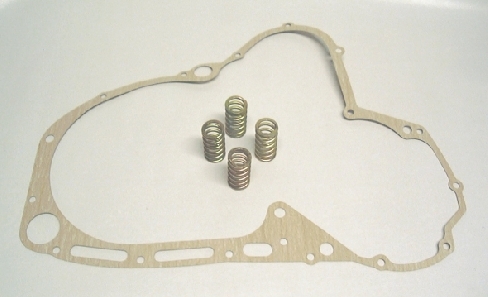 Clutch Spring Kit - Includes Barnett clutch springs and clutchside engine cover gasket. Providing better clutch lockup than OEM springs, these springs will eliminate clutch slippage. If your clutch is slipping under some conditions then these springs will likely cure it. From my experience, the Cade clutch rarely wears out but the springs get weak. Includes a clutchside cover gasket. I recommend Barnett clutch springs for every bike that comes into my shop. Price does not include shipping. 50 state shipping for this item alone is $6.50. When ordered with other items, shipping will be calculated based on the weight of the total order at time of shipment.